Happy Friday everyone, I have something super sweet …. or not so sweet, to share with you today! I can not wait to share the full reveal with you tomorrow! This is a peek at the kit that La, Rubia, and I have been working on. It is coming out tomorrow at SSD. 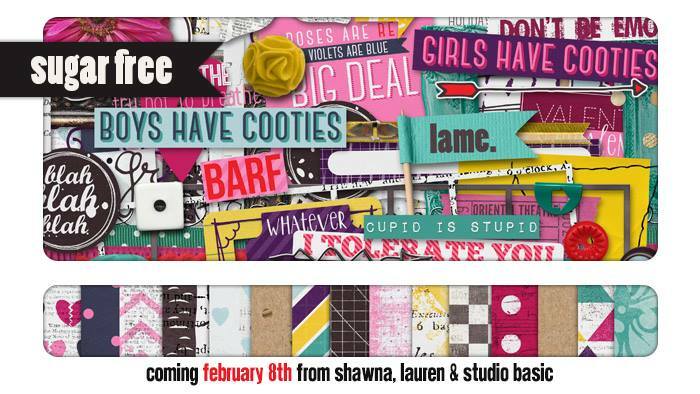 It is totally perfect for the angsty Valentine lover or hater! It can work both ways! It is great for boys as well as girls! If you want a chance to win this kit, just leave a comment telling me who this kit would be perfect for in your life! Also, feel free to share with any social media resources and leave a separate comment with the link for extra chance to win! Now, in addition to this collab I’m also plugging away over here at a special solo kit – every year I like to have something for valentines day that is especially boy friendly and I’m so super dooper excited about what I’m working on for this year!! I can’t wait for everyone to see! So come back tomorrow to check it out, and to find out the winner of the Collab! Good luck, happy Friday, and speedy scrapping! This kit would be perfect for my sister. She just got out of a serious relationship that didn’t end well and is anti boys (and love) right now. Thanks for the chance to win it!